The Nissan Juke continues to get a lot of attention this year from both the manufacturer and tuning companies, and after the Nissan Juke-R stole the spotlight a few months ago with its radical design, outstanding performances and outrageous price, a lot of Juke enthusiasts wished they'd had a less costly and easier to buy alternative, and that's where the Senner Tuning Nissan Juke came in. 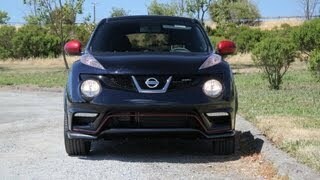 Now however, there's a new kid on the block, the Nissan Juke Nismo 2013. At first the Nismo concept was revealed at the Tokyo and Geneva Motor Show, but now the sporty crossover is ready for production and will make its debut at this year's 24 hour Le Mans race, alongside the Juke-R and the Nissan DeltaWing. Since the Juke-R is where it all started and since the R came with the engine found in theGT-R, one of the most important aspects when tuning a Juke is giving it a boost of performance. That being said, the Nismo Juke comes with a modified version of the 1.6 liter direct injection turbocharged engine which was inspired by the power plant found in theNissan DeltaWing. It sounds intriguing, but unfortunately Nismo has not revealed any numbers so we don't know how powerful the 1.6 liter unit really is. 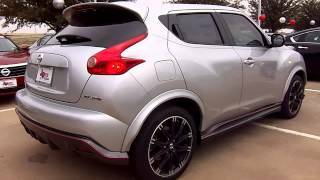 What we do know is that the Juke Nismo comes with new steering modifications which will improve both handling and traction control. Furthermore the beefed up crossover will also benefit from torque vectoring which will increase grip and cornering capacity by a whole lot. 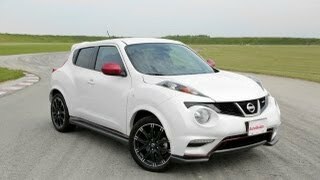 In terms of design, the modifications brought by the tuner are really not hard to notice and their take on the Juke features a new aerodynamics kit which is not just for show but drastically reduces the drag coefficient as well. The body kit includes lower front and rear bumpers, a modified grille, wider wings and side skirts as well as a tailgate spoiler. To sweeten the deal Nismo is also offering a new set of 18-inch allow wheels paired with wider tires for improved grip. Aerodynamics aside, I must point out that at least from my perspective, there's an inconsistency when it comes to the crossover's design. 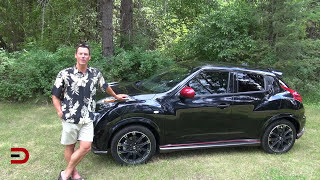 The original Juke featured roundish and fluid design elements, and it's a weird looking car to begin with, but the problem withNismo is that they offer the exact opposite: sharp and straight lines, rough corners and the lot. It just doesn't look aesthetically appealing. Some modifications have been brought inside the cabin as well and the Nismo package includes a new steering wheel, gauges, pedals, gear knob and door trims. To root the Juke further in the Nismo family tree, special suede-trimmed Nismo sport seats with red stitching have replaced the stock ones, offering not only a sportier design but also increased holding while cornering. 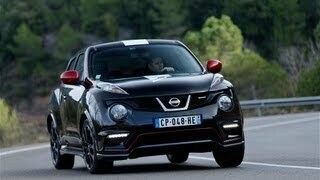 As far as pricing goes no details were given but we're bound to find out more details regarding the matter once the Nissan Juke Nismo 2013 makes its debut at Le Mans.